I had a client contact me and said there were a handful of users that were experiencing a 500 Error when logging into the OWA and/or ECP in 2013 Exchange. All other users were fine and had no issues. Let’s recreate the user experience. Below is an exercise we will be go through that will refresh the IIS cache on the CAS server. 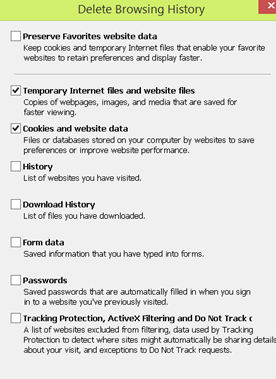 After this process have the user try logging into the OWA using IE in “in private browsing” mode. This mode keeps the web server from caching anything locally and is a great method in testing local cache issues. The result was that the user was able to successfully access the OWA. I had the user close the browser launch a new browser and try again in IE, but this time not with In Private Browsing. Again it worked. I had the User close the browser and try again. It failed and the user got the 500 error again. Instructed the user to close the browser and open internet options – go to the advanced tab and click on reset. This resets the IE settings back to default. I had the user open the internet options again and go into the general tab and select delete to delete the cookies and temporary files. Above displays the settings I had the user select (un-select). The user then clicked delete and closed the browser. 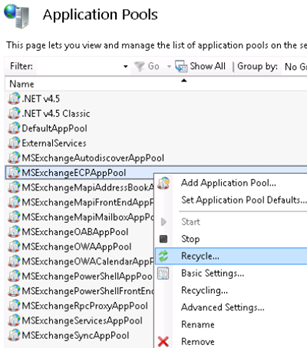 I performed the Application pool recycling exercise from above again and performed the tests again with the user. 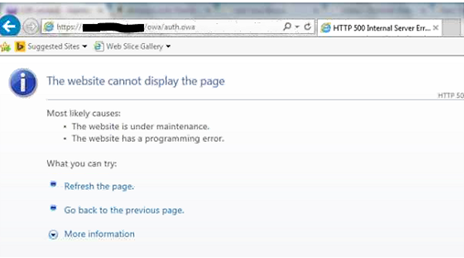 User opened IE without “in private browsing” mode again and attempted to login to OWA – result success. I tried the same steps with another user that was having troubles with the ECP. He too was able to gain access to the ECP. Digging further I noticed that another user was having a problem with setting up a partnership with his iPhone. I used http://testexchangeconnectivity.comto troubleshoot the issue.